Way back in January during the big reveal of the Switch, Nintendo lifted the veil on Fire Emblem Warriors, the latest collaboration between the big N's internal teams and Koei Tecmo. After plenty had fun with Hyrule Warriors on Wii U and then Hyrule Warriors Legends on 3DS, it seemed logical to give the Fire Emblem franchise the spin-off treatment. Though primarily showcased on Nintendo Switch, it's worth noting that this one will also come to the New Nintendo 3DS. When we took it for a spin on Switch we rather enjoyed it, especially with so many nods and winks to series fans. During E3 we were also fortunate enough to sit down with Yosuke Hayashi of Koei Tecmo and Masahiro Higuchi of Intelligent Systems to talk about the characters in the final game, the game's design, DLC plans and even a potential sequel. Read on for the full interview. How did Fire Emblem Warriors come to be? Hayashi-san (Koei Tecmo): I worked on Hyrule Warriors, and in Hyrule Warriors Legends - the 3DS version of the game - you could move characters around the map on the touchscreen. So, at that time when we were working on the game, we thought that this would be a really great fit with a Fire Emblem game. Some of the strategic elements of the Fire Emblem series, like the weapon triangle (would work well), so that was kind of the time we came up with the idea and made the proposal to Nintendo for the game. Higuichi-san (Intelligent Systems): So, from Intelligent Systems’ point of view, we were in charge of the supervision of the characters within the game, so the proposal first came from Koei Tecmo to Nintendo, and then from Nintendo to us, so we really started thinking about all the different ways that the characters could be carried over from the different Fire Emblem games into this game. And also, we’re fans of the Warriors series, so when I first heard about this proposal from Nintendo, I was just really excited to do a Warriors game in the Fire Emblem style. In the 5th June issue of Famitsu, you stated Fire Emblem Warriors is focused more on Shadows, Fates and Awakening. Is there a reason those three titles are the main focus for the roster in Fire Emblem Warriors? How was that decision made? 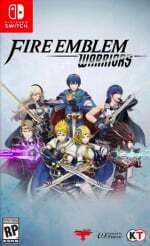 Hayashi-san: When we were deciding the playable characters for Fire Emblems Warriors, one of the things we had to consider was the different kinds of classes that would be represented within the game. If you just took the protagonists from all the different games you would just end up with swords, so that was one aspect of it. And the other was that you want to be able to switch between characters on the map, and you would want a variety of classes to be represented in order to have the most interesting kind of gameplay, and we thought these three titles had a pretty good spread of the different kinds of classes, so that’s why we ended up going with them. As far as this game is concerned, we noticed that the visual style is quite a bit different than Hyrule Warriors. Is this due to the different artistic nature of the series, or is this because you’re able to do more because you’re working with more powerful hardware? 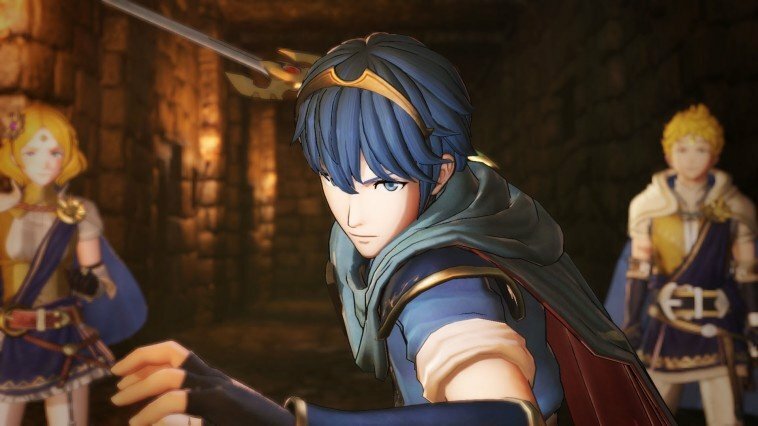 Hayashi-san: Rather than focusing on what the hardware specs were, it was more that a lot of the recent Fire Emblem games have attractive cutscenes in there, so we wanted to know what it would be like to have those characters that are shown in those movies as playable characters moving in real time in an action game, so that’s the visual aspect of it that we were interested in. Also, representing the visual style of the Fire Emblem characters in this game was really important to us. One of the more interesting aspects of the demo that we played was the ability to pair characters together and make them fight alongside one another. Is that a nod to the existing relationship systems in the Fire Emblem series, or is this something entirely new? Higuchi-san: Well, as you know in Fire Emblem games, you have that feature where you can take two characters and combine them into one space on the map. So, you’re going from two to one when you do that, but you have a lot of advantages like stronger attacks and better defence and that kind of thing, so we thought that’s kind of an aspect that would also work in the Warriors style of games. And if you have that, then it makes sense to have characters creating these stronger bonds between them, and that’s why we had the idea of characters getting closer by fighting in battle together. Hyrule Warriors enjoyed a very long life post-launch thanks to DLC and free updates. Are there plans to support the game after launch with additional content? Hayashi-san: We definitely appreciate the fact that people are looking forward to that kind of follow up after the main game is released, but right now we’re just focused on creating the main game, so that’s something you’ll have to wait to find out about until later. There are two original characters in this game: Lianna and Rowan. Are we able to delve into who these characters are and why they exist in the Fire Emblem world? Hayashi-san: Since in this game we were able to gather together all kinds of heroes from other Fire Emblem games, we didn’t want to create some kind of protagonist who’s too strong and would lead all those other characters; it just didn’t seem appropriate somehow, so we wanted the story to be about the other Fire Emblem characters who these two protagonists could learn from and kind of develop as individuals. That’s why they were set as a little bit younger in age than most lords you would see. Also, we had them look different from the other kinds of lords that we’ve seen in the past, and we made them twins because we wanted players to have an option of having both a male and a female playable character; that’s how we came up with the design and the background for these characters. In the demo we played, we had the male protagonist in our group and the female protagonist was on the opposing side. If we choose the female protagonist do they just swap? Hayashi-san: We couldn’t reveal all the playable characters that would be in the game for this demo, so that’s why we were kind of limited in which characters we could choose, so it’s not necessarily the case that the male protagonist will face off against the female protagonist, but for this demo these were the characters we could choose. Fire Emblem has enjoyed a long history of success in Japan, but has only recently become mainstream in the West with he launch of Awakening for the 3DS. With Hyrule Warriors, Zelda was already massively popular. Is it the hope that Fire Emblem Warriors will further establish the Fire Emblem franchise’s popularity? Higuchi-san: Well of course we’d be happy if players who played this game became more interested in the Fire Emblem franchise and went back to past games and played those; that would be a great result. But, basically what we’re excited about with this project was having these characters from past FE games show up in a Warriors game where they could be involved in the thrilling action of taking on hordes of soldiers, which is a kind of experience that’s a little different from the Fire Emblem games or the way that you’ve seen them before. If Fire Emblem’s fans play this and this is the first time they play a Warriors game and they fall in love with the Warriors-style games that’s great. If Warriors fans play a Fire Emblem themed game and grow interested in the franchise, that would be great too. If everything goes well and people enjoy the game, it would be great to make a sequel where we could offer many of the other characters that people have been hoping will show up in the game. 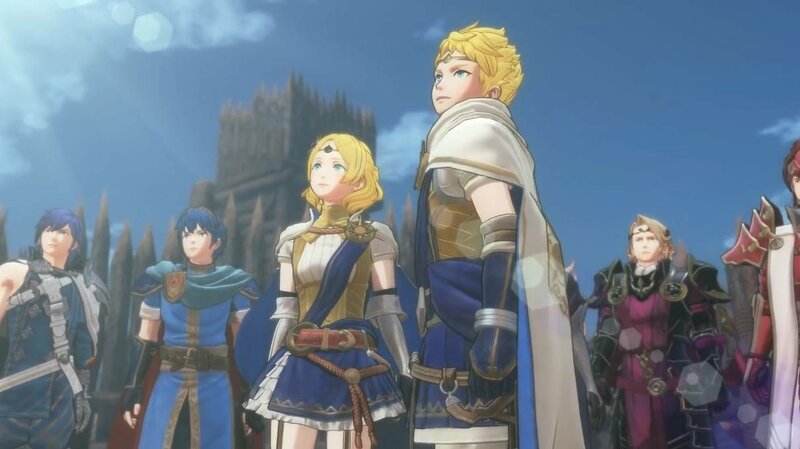 Adding on to that, if this game does see good success, do you see it possibly informing your decisions around what the Fire Emblem franchise may look like in the future? Higuchi-san: As you know, while the Fire Emblem games are simulation RPGs this game is an action game, so they’re a little bit different in terms of their game style. But one thing that I was really impressed with in this kind of Warriors game was the graphics and visual aspects of the game, like the extravagant visuals you get to see while playing the game. I was really excited to experience that with this game. When it comes down to it, those visual aspects are something that we’d love to add to our games as well. In particular, in this game, they have the victory sequences for each character and I thought those were great. Some of those cutscenes and visual aspects are something I really thought were great about this game and possibly could influence us. Going back to Hyrule Warriors, there was some adaptation to make a Zelda game work in the context of a Warriors title. 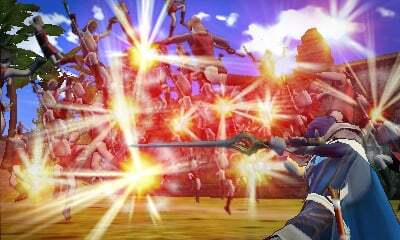 Comparatively, was it easier to fit Fire Emblem in the Warriors mould as it was already an army-vs-army type of game? 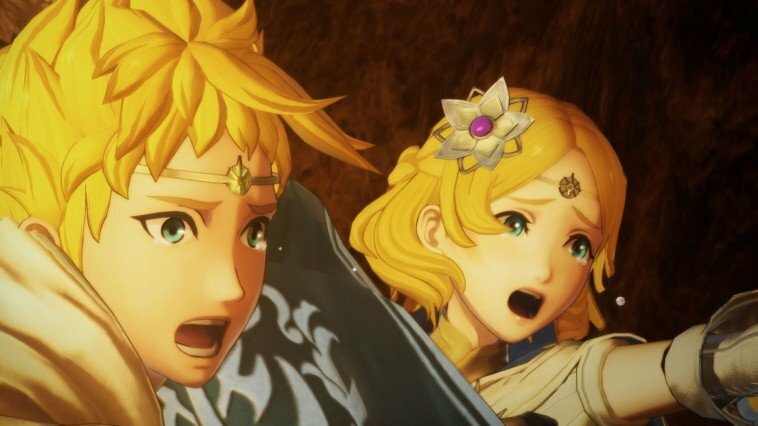 Hayashi: With Hyrule Warriors we just thought, “Well, we could add all kinds of elements from the Zelda games and it will somehow work out,” but actually with Fire Emblem Warriors, the Fire Emblem games and the Warriors games are quite different in style, because Fire Emblem is a simulation RPG and the game style is you stop and you think and you strategize before you make your next move. So you’re also making considerations about what you’re going to do whereas the Warriors games are action games and you’re in the flow of battle and you want to maintain that tempo as you’re playing through the game, so it was actually quite difficult to make in a way; to create that balance between having an action game and incorporating the strategic elements of the Fire Emblem games. There was a lot of trial and error that we went through during the development of the game and we’re always considering that perfect balance between the two styles of gameplay. Earlier, we touched on two characters battling together and how they strengthen their bond over time. Does that have any benefit to the player? If you keep those characters together do they become stronger when paired or do they learn new techniques or anything? Hayashi-san: As you know in the Fire Emblem games when you have characters work together, there are advantages and disadvantages to that. You’ll have fewer units to move around the map if you combine them, but at the same time they’ll be able to become stronger and defend each other, so we wanted to add that aspect to the game. We thought it would work in the same way where you could have combined characters, like a strong character with a weaker character or switch between characters that use different kinds of weapons so that you would have the best advantage or effectiveness on the battlefield. We really wanted players to consider what kinds of risks they’re taking when they double up characters or change up characters. Is Fire Emblem Warriors going to have local splitscreen, similar to Hyrule Warriors? Hayashi-san: Yes. We anticipated people would like that kind of gameplay, so we’ve made local co-op available where you can separate the joy-con from the system and play splitscreen. Are there any plans to use the existing Fire Emblem amiibo within Fire Emblem Warriors? Hayashi-san: Yes. This game is definitely compatible with all the Fire Emblem amiibo that are out here. We can’t say exactly what kind of extras you’ll get from using amiibo in the game, but we can say that they’re compatible. Is there any plan for any type of online functionality? Hayashi-san: At this point we don’t have any online functionality, it’s more offline multiplayer. With the three games that are being focused on for the roster, there’s still an enormous amount of characters to choose from. Is there any one character that either side has really had to fight for to get into the game? Higuchi-san: Actually, Koei-Tecmo first came up with their list of characters they’d like to add to the game, and then we looked at them we were like, “could we add this or that character,” so they made a few more suggestions of their own. How long had Fire Emblem Warriors been in development before its reveal to the public in January? Hayashi-san: We had already started considering the idea for the game before that, and had already started working on some initial designs, so that works out to about maybe two years ago when we started working on this game. And was there anything in particular about developing for the Switch - since this is the first Warriors game that is developed strictly for it - that surprised you, or things that you were able to do that you didn’t think you’d be able to given the new hardware? Hayashi-san: We definitely got proposals for games where you could have a Warriors game available on a handheld system, but one of our concerns is always that we want the game to look good on a big screen, and we don’t want the quality to be compromised, so with the Switch you can do that by putting it in the dock and have it show up on a big screen and it looks very good. So we thought that this is a game that would be great to play on the TV when you can and also use handheld mode and play it on the go when you would like. As I mentioned before it’s also great for local multiplayer. If you could work on one other Nintendo series beyond Zelda and Fire Emblem, which would your next choice be and why? Hayashi-san: We don’t have any concrete plans at the moment, and even the idea for this game came about naturally. At the moment we’re focusing on Fire Emblem Warriors, so it’s something that if it happens, it happens. We'd like to thank Yosuke Hayashi and Masahiro Higuchi for their time. So... They're Going to make a sequel with classic FE characters? But what if the original sells poorly because it DOESN'T have classic FE characters!!? "it's worth noting that this one will also come to the New Nintendo 3DS"
Does this mean it is exclusive to the N3DS/N2DS or is that just a turn of phrase because the "New" iterations are the current hardware? Co op was what i played most of on HW, though honestly I could have done without any of the original characters for that game. I think that reasoning for the characters makes enough sense. Just make sure to at least have the most popular characters from those older games. Yeah it's sad the focus on Awakening and Fates, but come one guys stop complaining, is the logical move to do. I'll buy day one and if the add more char from older games as DLC I'll buy also. I would be bummed about the lack of online but other Warrior titles either don't have it or if they do there are bizarre limitations like "online can only be played on levels both players have finished"
Not expecting great things. Just hoping it'll be good. Haven't beaten the game yet but from what I've seen it's occasional Titan mode (Eryn). Maybe after the game's beaten it might have a Titan mode. Being a Titan is fun but I prefer using the traditional omni-directional mobility gear with the blades. It's basically Husbando Emblem Warriors right now. Where are the Waifus? @Mr_Zurkon I do believe it was confirmed to be new 3DS exclusive in the reveal. @Mr_Zurkon Hyrule Warriors Legends didn't run well on the original 3DS, but played fine on the New Nintendo 3DS. Its not a surprise to me that they dropped the original 3DS support. I had my doubts about Fire Emblem Warriors but after E3 I feel ok about it. I played Hyrule Warriors non-stop so I feel like I could get into this game. I just wish there are characters from older Fire Emblem games like Sacred Stones, Blazing Blade, or Path of Radiance. Hell it would have been cool if this game had those new characters from Fire Emblem Heroes. I'm not expecting a masterpiece, just something that's ok. Where's my Nintendo Warriors. I'd love to see Mario beat an entire army to death. Absolutely love the map and how colorful it is with the sprites. Fantastic! And Xander on the horse is crazy cool. Glad to see Chrom, and female Corrin... maybe male Robin as a mage would be great. Gotta have Frederick, and Shiida (sorry, Caeda). And the Vaike. Love the Vaike. But I'd really prefer to see Alm and Celica, and Mae or Saber. Don't think that'll be the case. Not enough people played the old games to keep the series alive... seriously doubt that number of people is somehow going to make or break this game, especially when most FE fans adore the 3DS entries. I was just hoping for Alm and Celica. Maybe it'll be DLC. @xaviorq8 totally agree. They just chose the "logical choice". The first game, and the most popular last games: waifuism triumphs again. @yokokazuo That would make sense if it was. I probably just missed the exclusive part of the announcement. @Sauron75 Nintendo Warriors would be pretty cool. And it would be cool to get Xenowarriors one of these days, though it may be hard to connect all of the stories from the Xeno games. "If you just took the protagonists from all the different games you would just end up with swords, so that was one aspect of it." Nice to hear there is splitscreen. I didn't really like HW's solution as the Gamepad player got a small screen. I still believe they went for a focus on the latest games since those seem to be the most profitable. As long as Tharja is there I will be happy. As long as the horse that can do no wrong is in this the game will be fine. Seriously though FemKamui is about to teach some mooks the meaning of war. Why does one of the screenshots say "New 3DS transition" ? I thought it was exclusive to Switch! Didn't they say the same thing about Hyrule Warriors? I hope this does well, but I would have been a lot more interested in that.